It’s not surprising in the age of the rapidly expanding video ecosystem that consumers expect to be able to watch whatever they want, whenever, wherever and however they want. Traditional linear TV has long been a mainstay for providing quality content that viewers love, and OTT provides a dynamic environment in which they can experience this content on their own terms. It just makes sense that the two worlds are colliding. 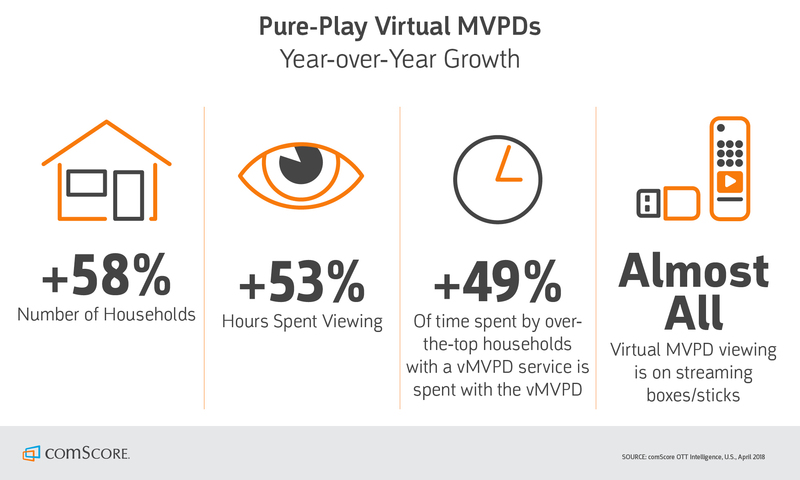 Virtual MVPD use is still small but growing rapidly. OTT viewers are spending significantly more time watching vMVPDs. vMVPDs are being adopted by more than just the younger generations. Households using pure-play vMVPDs are super users of OTT in general. Click here to read more and to see the facts behind the indicators above on the comScore blog.